Pattern Description: B7219 Burda Style Dress & Blouse – Light summer blouse with a tiny slit, V-neck and collar. Enchanting lingerie style dress with lace applications and tie belt. Pattern Sizing: 10 – 22 (European 36 – 48) which corresponds to bust sizes 33 inches to 43.5 inches (84-110 cm). I made a size 20 for a high bust measurement of 41.5 inches. Instructions: They were fine. I would change the order, so that I trimmed the pattern piece seam allowances for the armholes before cutting my fashion fabric instead of trimming the fashion fabric after the shoulder seams are sewn. LIKE: I was drawn to the pattern by the neckline. DISLIKE: They don’t mention trimming the seam allowance for the tank top armholes until you have the shoulder seams sewn. DISLIKE: Just like almost every other pattern out there, they make no allowance for and no suggestions for busts larger or smaller than that the pattern was designed for. DISLIKE: What cup size was the pattern designed for? A white, cotton pique that I’ve in my stash for quite a while. 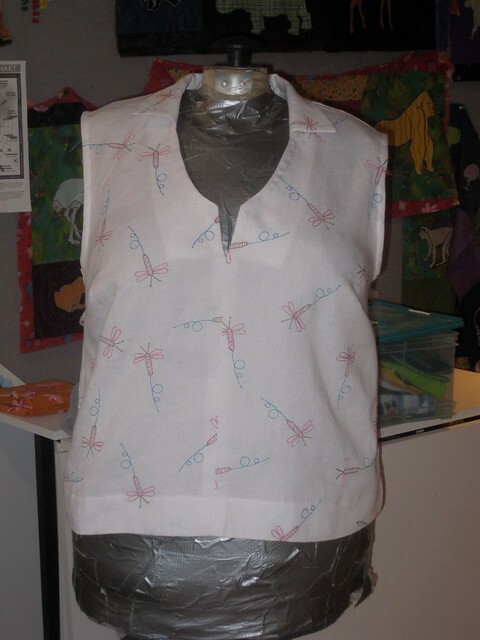 It is heavier than the fabrics suggested, and I think the pattern would be better with a lighter fabric. I did a full bust alteration. I don’t know if I would make it again. Maybe. It fits great, and I do like the neckline. This is a nice, easy, basic for a wardrobe.